probably the most comprehensive (books) ever compiled about our long distance paths. 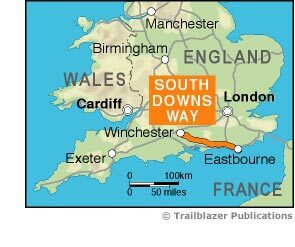 The South Downs Way is a 100-mile (160km) National Trail that follows the line of chalk hills stretching from Winchester in Hampshire across Sussex to Eastbourne. Walking the length of the Downs is the best way to experience this beautiful landscape with its mixture of rolling hills, steep hanging woodland and windswept fields. You'll also pass picture-postcard villages with welcoming pubs, thatched cottages and quintessentially English country gardens. Includes 60 detailed walking maps: the largest-scale maps available – at just under 1:20,000 (8cm or 3-1/8 inches to 1 mile) these are bigger than even the most detailed maps currently available in the shops.